Product prices and availability are accurate as of 2019-04-26 10:22:14 UTC and are subject to change. Any price and availability information displayed on http://www.amazon.co.uk/ at the time of purchase will apply to the purchase of this product. 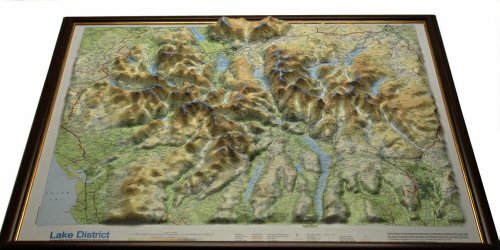 Like the similar map in a light wood frame this Lake District map in 3D raised relief (size: 82.5 x 74 cm) makes an excellent gift for someone who loves to walk, climb, fish, sail, or just generally amble among the Lakeland mountains. In addition to hanging on a wall at home or in the office this raised relief map can help hotel and guest house owners and staff explain the layout of the area to their visitors. A further use is in education. In a school setting it can either be hung vertically on a wall or installed horizontally for puplis to look down on the modelled terrain. The map can be bought unframed.